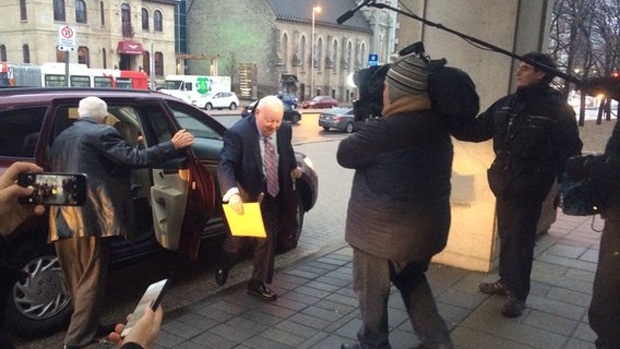 Senator Mike Duffy returns to the witness stand today for a second day of cross-examination by the Crown at his Ottawa trial. Duffy, who has pleaded not guilty to 31 counts of fraud, bribery, and breach of trust, became testy at times yesterday while he was grilled by Crown lawyer Mark Holmes. At one point, Duffy said he would not entertain a particular line of questioning. Holmes suggested it wasn't right for Duffy to file living expense claims after his appointment to the Senate in 2009 because his primary residence was an Ottawa suburb where he has lived since the 1970s. Duffy said he's a senator from Prince Edward Island, he lives in P.E.I., and he has not broken the rules or the law. At another point yesterday, the Crown and defence lawyers met with the judge to talk about the need for additional weeks in the new year to wrap up the trial, which began last April. Reading in an app? Tap here for the full experience.